Today I found out gyroscopic effects have almost nothing to do with your ability to ride a bike. The problem with the forces generated from the gyroscopic effect on a typical bicycle is that they simply aren’t very powerful when considering the physics involved in having the majority of the center of mass of the bike at the top (with you on it). You are basically forming an inverted pendulum, which is much harder to balance than the other way around. To illustrate how much force is needed here, have a person get on a bike that is completely still. Now try and hold the bike and person centered by simply holding on around the axle of one of the tires. To compare this force with the amount generated from gyroscopic effects, take a detached bike tire with pegs on the sides and hang on to them. Now have someone spin the tire really fast; once it’s spinning, try to lean the tire one way or the other. In this later case, you’ll feel the gyroscopic effects, but you should be able to do it somewhat easily as the force you’ll feel here is likely only a few kilograms or 5-10 pounds (though it might feel like more with your arms outstretched and straight in front of you). In the previous case, with the person sitting on the bike, unless they were extremely light or you are Hercules, I’m guessing you couldn’t even come close to keeping them balanced, particularly if your arms are outstretched fully. When riding quite fast at 12 mph, (about 6 m/s), a typical bike wheel (diameter 600 mm, circumference 2 m) rotates 3 times per second, which is a spin rate of w = 20 radians per second. Its peripheral mass, around m = 1kg, is concentrated at the rim, i.e. at a radius of r = 300 mm. The moment of inertia J is therefore J = m r2 = 0.1 kg m2 (near enough). Suppose I am falling over and I try to use the gyroscopic effect to help push me upright again. Consider some pretty frantic wobbling of the handlebars back and forth sinusoidally at a rate of, say, fhandle=1.6 wobbles per second (equivalent to an angular frequency of wobbling w handle= 2 p fhandle = 10 radians per second) and at an amplitude of, say, +/- 6 degrees (ie Mhandle= 6/180* p = 0.1 radian) . The wobbling motion is therefore Thandle = Mhandle sin(whandle t), and differentiating this gives a peak handle wobbling speed of Q = whandle. M handle = 10 * 0.1 = 1 rad/s . This is the forced precession rate of the front wheel acting as a gyroscope. The bike and I weigh, say, 100 kg = 1000 N, so the gyroscopic effect will only help me if I don’t tilt more than 2 mm from being perfectly upright (1000 N * 0.002 m = 2 N m). So the gyroscopic effect on a bicycle, even at 12 mph, is practically nothing in terms of what would be required to keep you upright. So how are you not falling over every two seconds on your bicycle? Partially this is due simply to your ability to balance. However, you’ve probably noticed it’s hard to stay balanced on a bike when at a stand still. When you start to go really slowly, you’ll notice you naturally make large steering corrections to keep yourself balanced. This, in fact, is the primary thing that is actually keeping you upright on a bicycle at any speed, namely corrective steering. As you feel an imbalance in one direction, it will cause you to steer the bike in that direction to compensate, the resulting centripetal force ends up balancing you back out, assuming your adjustment was the proper amount of turn given your speed and other such factors. If you over turned, then you’ll have to make another correction to compensate for the imbalance created from your over correcting. The faster you go, the smaller the correction that is needed to keep you balanced. In the beginning, these corrective motions tend to be relatively large and often with you overcompensating, because your body is still learning to ride a bike. This is why you tend to be a bit wobbly and wreck a lot when you are first learning. Over time, these corrections will get smaller and smaller and more accurate until you don’t really notice you are doing them at all while you ride a bike above super slow speeds (obviously you’ll still notice them when barely moving on your bike and the like, as pointed out above). Many people think that if you took two tires and spun them in opposite directions, that you’d have the same gyroscopic effect as if they were spinning in the same direction. In fact, what will happen is that, if the wheels were spun in opposite directions, the two would cancel each other out, in terms of gyroscopic effect. This fact has been used to demonstrate to people that they can ride a bike with no problems without the gyroscopic effect by mounting extra wheels raised slightly off the ground which counter rotate the actual tires. The farther forward the center of mass for the bike + person riding the bike, the less front wheel movement that will be needed to maintain balance. This is probably most noticeable on certain custom motor cycles where the front wheel sticks well out from the bike. Another less known factor in a bike’s ride-ability is something called “trail”. Simply put, this is a measure of how much the distance from the front wheel’s point touches the ground trails the steering axis’ contact point, which is where the entire steering mechanism (fork, handlebars, front wheel, etc) pivots. A longer trail will make a bike feel much more stable than a shorter one. However, if the trail is too long, the bike will feel difficult to steer. Bikes with too little trail, or even negative trail, will feel inherently unstable; though, due to corrective steering, you can still ride them. Due to the steering issue with the increased trail, mountain bikes and touring bikes typically have much less trail than street bikes. In the case of mountain bikes, this allows for more “agility” on the bike to help compensate for rough terrain. In the case of touring bikes, this helps compensate for the fact that you’ll probably be packing along quite a bit of baggage with you and thus, extra weight low to the ground. This is why touring bikes will often feel unstable if you don’t have that baggage added on and low to the ground. While gyroscopic and trail forces aren’t nearly sufficient to keep you balanced on a bike, they are typically sufficient to keep a riderless bike going straight until it slows to a certain point, which varies from bike to bike based on wheel size and trail. 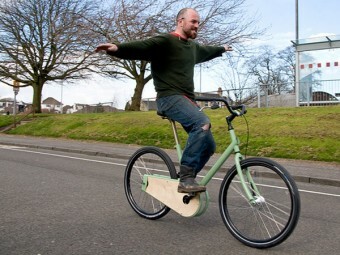 Something called a “gyrobike” is currently in development to help people learn to ride bikes. This bike has an internal flywheel that provides a significant increase in gyroscopic effect. The inventors of this bike then hope that one could be developed where the gyroscopic effect would be sufficient to keep the bike mostly balanced even with a rider, while still not being too cumbersome a bike in terms of weight and the like. Another place you’ll see this somewhat subconscious “auto-correcting” phenomenon pop up is when you are trying to stand in one place on one foot. When doing so, you have to carefully balance yourself to keep from falling over. As soon as you start hopping though, most people have little difficulty keeping themselves balanced. This is because, when you hop, you not only somewhat naturally generate corrective movements, but you will also have your foot land around where it needs to be to keep yourself balanced. Can’t see the forest for the trees. There’s a much simpler way to see how much the gyroscopic effect helps. Get one your bike and try to balance it without moving forward. Sit stationary on your bike as if you were riding but no pedaling, just trying to balance. Can you do it? Most people can’t, while they find it pretty easy to balance once the gyroscopic effect of the wheels is helping them as the move forward, even with the extra alternating sideways force of pedaling while doing it. @dave: I think you should read the article again. how do you explain not falling when youre leaning? I didn’t calculate in detail but this is what i think. The gyroscopic effect doesn’t push the bike itself upright. Instead it steers the bike. That way the gyroscopic effect does help to ride a bike. It actually steers the bike in the right direction for balancing but it doesn’t put the bike upright by itself. If the rider wants to tilt the bike over, he cannot do it from the top part of the bike unless he has a rudder and uses the passing air to push him over. The only way to get the bike to lean over is to move the bottom of the bike to one side of the top of the bike. You wanna lean right, steer left and the tires moves the bike left.but the top of the bike and the rider keep going straight and appear to have leaned to the right. BTW turning does not require leaning. A bike with training wheels turns as well as a normal bike. The geometry of the front wheel is such that if a bike leans over, the roadway will push the front tire sideways such that it steers more into the direction of the lean, thereby unleaning the bike to straight up. A bike will only remain in a turn if you hold the steering against the stabilizing geometry or if you are riding without hands on, then you must shift some weight over to that side and that causes the front wheel to point left or right. It is our ability to centre the bike under our centre of mass that makes the bike stand up. When the bike is stopped we cannot balance, since we cannot move the bike under the centre by steering. The faster we drive the less we have to steer to put the bike directly under our centre of mass. All we have to do is compare it to a bike equivalent with no wheels (a snow bike, for example), where there is no gyroscopic effect. End of debate. Thank you.